I love frozen and creamy almost as much as I love cake, so when I was coming up with this twist on a creamsicle, I knew just the ingredient to deliver the right texture. Using fresh mint and maple syrup brings some local, seasonal goodness to these creamy ‘sicles loaded with heart-healthy avocado. The pleasant bitterness of cacao nibs is a welcome crunch, but for those who need some more sweetness, use mini chocolate chips instead. Put the flesh from the avocados, coconut milk, maple syrup, mint leaves, vanilla extract, and salt in a food processor or blender. Process until smooth, scraping down the sides of the container if necessary. Stir in the cacao nibs. Divide the mixture into the molds and freeze until solid. Unmold and serve. Store extras in a sealable container or plastic bag in the freezer. *Once exposed to air, the avocados discolor quickly. Taste-wise, it won’t affect anything, but if this is an issue for you on the aesthetic-front, add 2 teaspoons lemon juice, though it will slightly affect the flavor. That’s why mine are ugly–but it doesn’t affect the taste. I was creating a recipe to use local Southbrook Vineyards‘ Bioflavia, an organic red wine grape skin powder loaded with antioxidants. Beginning with wine-waste—the leftovers from crushing grapes for wine—the skins are dried, separated, and milled into a fine powder. 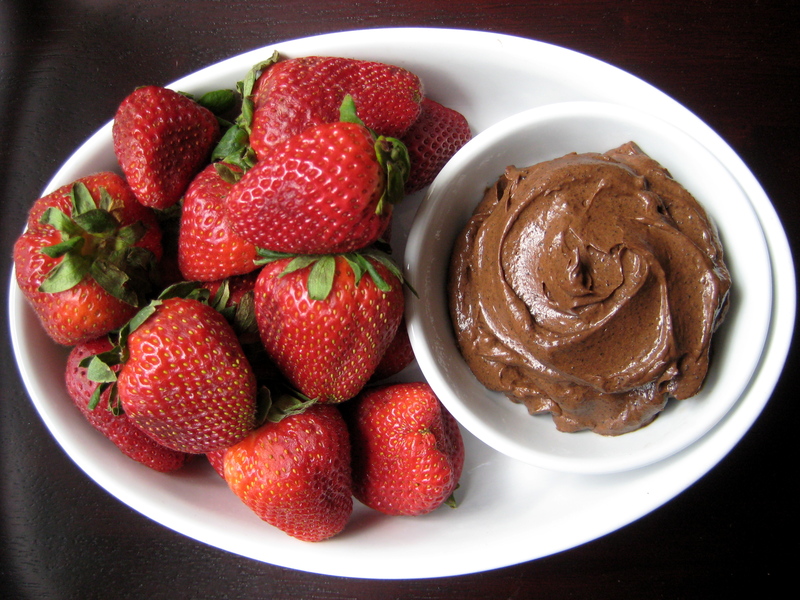 This dip is an antioxidant powerhouse, with both Bioflavia and cocoa powder as main ingredients. Enjoy as a fruit dip, use as a pie filling, or simply eat it with a spoon (I choose the latter). You can nix the Bioflavia if you can’t get your hands on it; it will taste the same. Put the avocados, cocoa powder, agave nectar, Bioflavia, vanilla extract, and salt in a food processor. Process until smooth, adding nondairy milk as necessary. 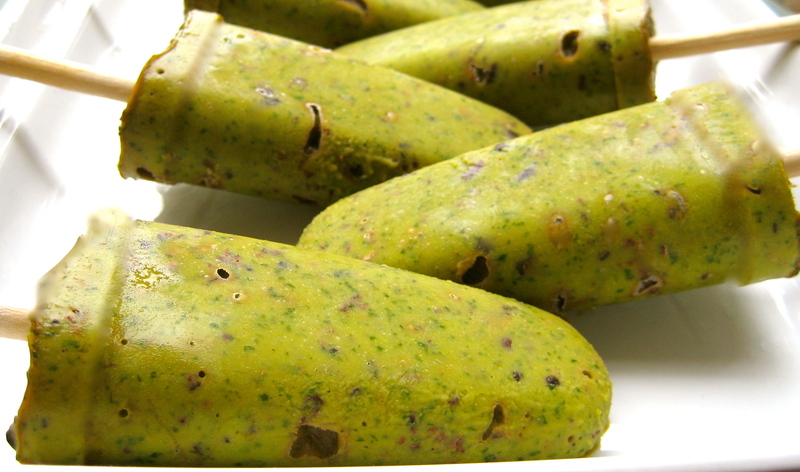 Refrigerate overnight before serving for best flavor. It will thicken in the refrigerator; thin with additional nondairy milk before serving if desired. Serve with fresh fruit, or enjoy as a pudding/mousse. *Bioflavia comes with a little scoop inside the container. Those little tiny blackish bits in the mousse are the grape skin pieces, but it doesn’t taste gritty (or like anything) at all. Just smooth, silky, deliciousness. The addition of edamame adds a bit of texture and protein, rounding out the fat/protein/carbohydrates you need to justify this as a balanced lunch. Right? Stir together the lime juice and oil. Brush each tortilla with the mixture. In a small bowl, mix together the cumin, chili powder and salt. Sprinkle each tortilla with the spice mixture. Stack tortillas, and cut into six to eight triangles. Bake for about 10 minutes, until lightly browned. Put the avocado flesh, edamame, garlic, lime juice, sea salt, cayenne pepper and ground cumin in a food processor. Process until smooth. Transfer to a bowl, and stir in onion, tomatoes and cilantro. Refrigerate for a few hours before serving. 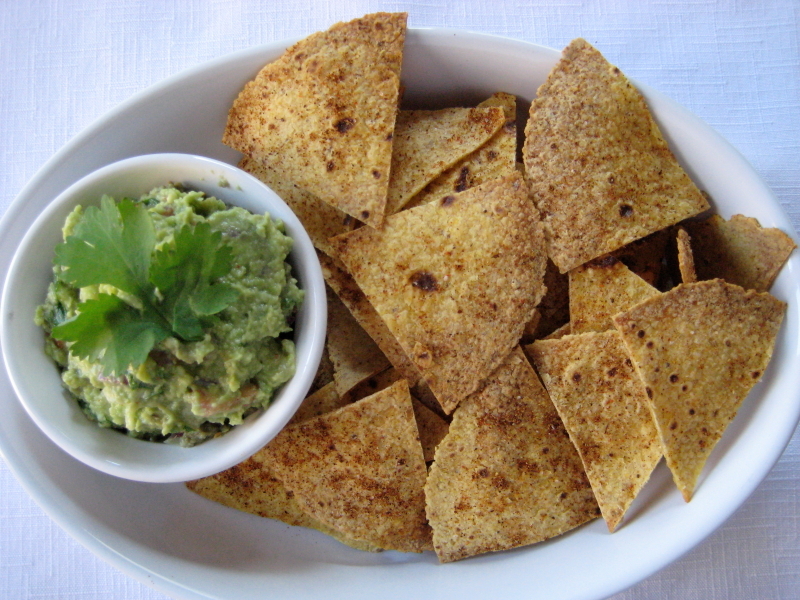 Just before serving, test the guacamole for seasonings. Garnish with additional cilantro.